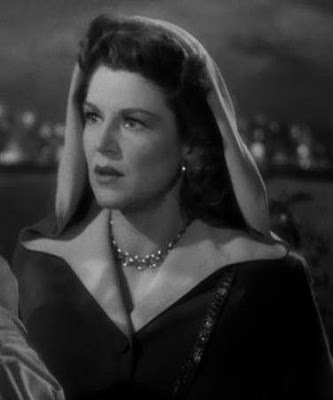 Robert Wise's 1947 crime picture Born to Kill is noir right down to its very soul. Based on James Gunn's novel Deadlier Than the Male, photographed in unflinching starkness by Robert De Grasse with gowns by Edward Stevenson. Wait. 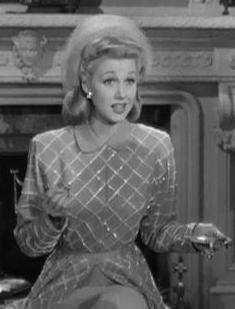 "Gowns by Edward Stevenson", the guy that made Lucille Ball such a fashion-forward and timelessly snazzy dresser in all of her TV shows? That guy? Yes indeed, the Texas born Stevenson had been making Hollywood's leading ladies look their best since the 1920s and helped RKO gain respectability in the looks department. His one Oscar win was shared with Edith Head for 1960s The Facts of Life starring, you guessed it, Lucille Ball. Born to Kill is a lurid tale of murder, lust, secrets and twisted loyalties. As the viewer is taken on the journey of violence and, shall we say poor choices, the viewer is also shown what their closet would look like if they had money or their best friend was Edward Stevenson. 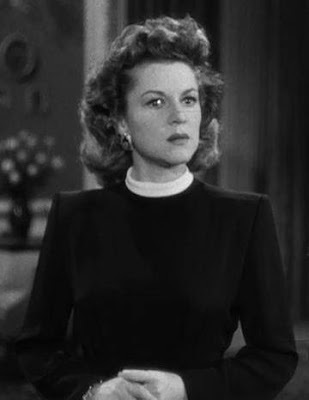 Claire Trevor as Helen Brent is obsessed with murderer Sam Wild played by Lawrence Tierney. Her other obsession is money. She doesn't have any of her own, but she's around it and, boy, she dresses it. Here's Helen at the courthouse in Reno where she has just divorced some poor schmuck. He probably didn't have enough money. He probably was sane. All is perfection. Note the hat and gloves, and there's a surprise. The rivets appear to be part of the suit jacket, but they actually belong to the strap of the bag which blends seamlessly with the ensemble. Imagine having a purse that you can only wear with one outfit! Laury is a gal who likes a good time and likes men. Her clothes give no doubt as to her intentions. Currently she likes a guy named Sam. Laury likes 'em tough. It won't last. Helen meets Sam. Sam meets Helen. I guess he was able to see something beyond this chapeau. 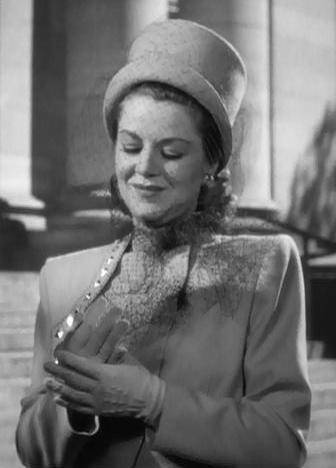 The fact that Claire Trevor can actually carry this thing off says a lot about character. I have one question for ladies of the 1940s - why? Now, this is quite the fetching travel outfit. The hat matches the scarf. The bag is ueber stylish and the fur coat is flung carelessly around the shoulders - looking like it doesn't care. This is Helen's half sister Georgia. Georgia is the moneyed one in the family. She always looks nicely put together and at ease. She's a good kid. Helen should look out for her. Now, that's a hat a gal can be jealous of. Helen spangles up and sparkles as much as she can edging close to over-the-top, but somehow staying true to her character. 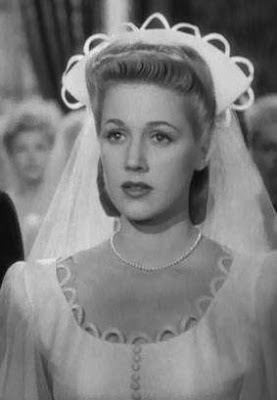 Georgia on her wedding day. I haven't quite made up my mind about the loops, but she looks demure without being prissy. She's a lovely bride. Too bad the bridegroom is a murderer with the hots for her half-sister. Too bad Georgia's Matron of Honour can't get her mind off the bridegroom. Her bridal like veil silently speaks her intentions as she stands in front of the minister and can't take her eyes off the groom. Too bad Helen can't see that the rest of the world, including her nice guy fiance Fred Grover played by Philip Terry, aren't as blind and dumb as she thinks they are. This silky number is what Helen wears around the mansion late at night to make warm milk or her new brother-in-law. As Helen becomes further embroiled with the unpredictable Sam, her look begins to soften. She's getting what she wants, but she's losing herself. This is Laury Palmer's friend Mrs. Kraft. She's on a dangerous quest, but she's dressed for it. A hat that size just has to come with a handy hat pin. This robe seems more like something Georgia would wear. Helen seems to be trying to hang on to some sense of normalcy. Not a spangle to be seen in Helen's desperate final act to save Sam for herself. 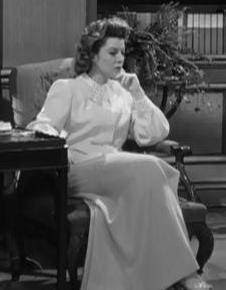 Stripped of the hat and coat, the "Mother Superior" vibe of this dress is cheekily at odds with a woman who realizes she's lost her soul. Helen may be one messed up, misguided gal but, thanks to Edward Stevenson, she looks good every step of her downward spiral. 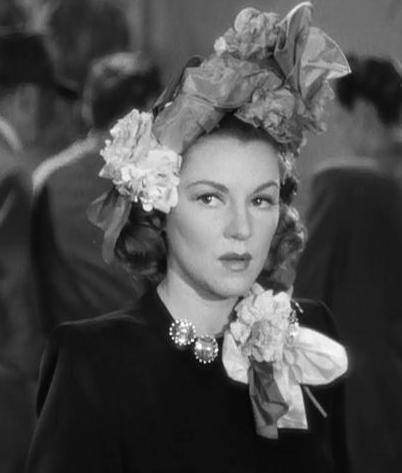 I'm thrilled to be participating in Angela of The Hollywood Revue's Fashion in Film Blogathon featuring many eye-opening and fascinating posts. Robert Wise knew his way around crime. If you get a chance, check out "The Set-Up", "Odds Against Tomorrow" and "I Want to Live!". His diverse filmography includes "The Day the Earth Stood Still", "Somebody Up There Likes Me" and "The Haunting". He really could do it all, and do it well. I have not yet seen this film.. The costumes seem very stylish for a film noir.. I do not think I have ever seen a purse made for one dress before.. Thank you for introducing me to, Born To Kill..
My pleasure, Dawn. "Born to Kill" is a dandy. Yowsa! Those 40 high fashion statements somehow haven't (as of yet) stood the test of time! But, you have to admit, put a gal in a hat and a pair of gloves and she is bound to get into trouble! Great post, CW! Loved your post, CW! 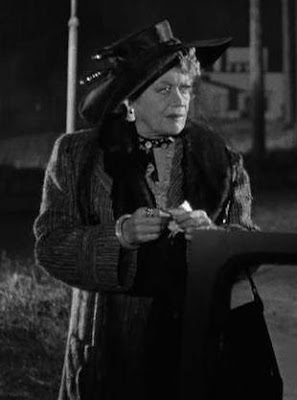 Born to Kill is one of my favorite noirs, and I just love Claire Trevor's wardrobe -- especially the number with the attachable purse, and the one with the matching hat and scarf. I also loved how you equated her clothes with her state of mind -- I never thought of that. Good stuff! 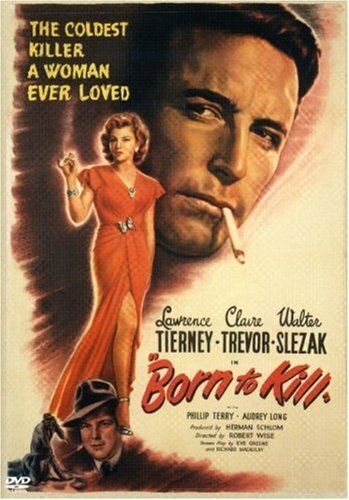 I've never seen Born to Kill, but you've really got me interested in seeing it. And I am obsessed with that purse with the handle that blends right into the dress. I have never seen anything quite like that before, but I love it. Wonderful post, thank you so much for participating in my blogathon! Flick Chick, I so admire the attention to detail that true fashion entails. I'm lucky if my shoes match! S&S, the wardrobe is both integral and distracting to the delicious "Born to Kill", isn't it? Thanks so much, Angela. I'm learning so much through your fabulous Blogathon. So pleased you stopped by, Christian. Glad to hear about your aunt's impression of Edward Stevenson. It's nice to learn a bit about the man behind the credit. This was fun, and so fascinating that the wardrobe is so illuminating about the characters. Wow! Miss Trevor looks very glamorous in this. I've never seen this film, but it sounds interesting. And I love the rivets on that suit. I want it so bad. That purse is fantastic too. I'm another one who has never seen this film, and I'm VERY unfamiliar with Edward Stevenson's work. I'm really glad you covered both this movie and the costumes. It looks fantastic on both counts. JTL, the characters leave a bad after-taste, but you can't get that wardrobe out of your head. Lady Eve, isn't it amazing how many people we still have to discover? That's my answer to folks who ask why I enjoy watching so many "old movies". "Comet", I know how you feel. That purse/suit combo is amazing. Thanks so much, Silver Screenings. I'm so glad you stopped by. 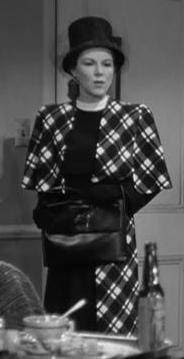 I ahven't seen this one, but noirs are very appealing to me and femme fatales are some of the best dressed characters in film history. 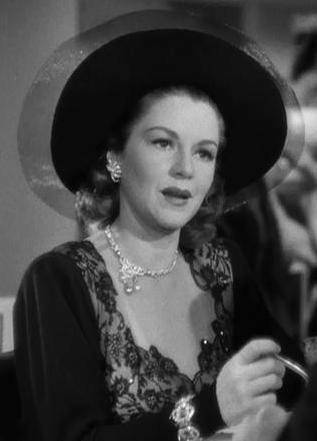 It would be a great opportunity to watch more of Claire Trevor. I'll be sure to head over to your post. I am not the type of movie fan who notices costumes first. I tend to forget about them, unless they are really bad and stand out, or really, truly perfect. 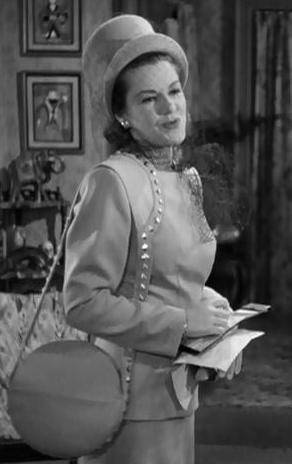 I did notice some of the costumes in "Born to Kill", but the one that stood out the most was Laury's in that opening scene. I loved how it made her whole outlook on life obvious. Such a great dress. I wonder where I could find one for my wife. He he he!